Are you using a CRM that you'd like to tie in to ActiveConversion? We have recently tied ActiveConversion into Zapier, a tool that links web apps together so they can share data. 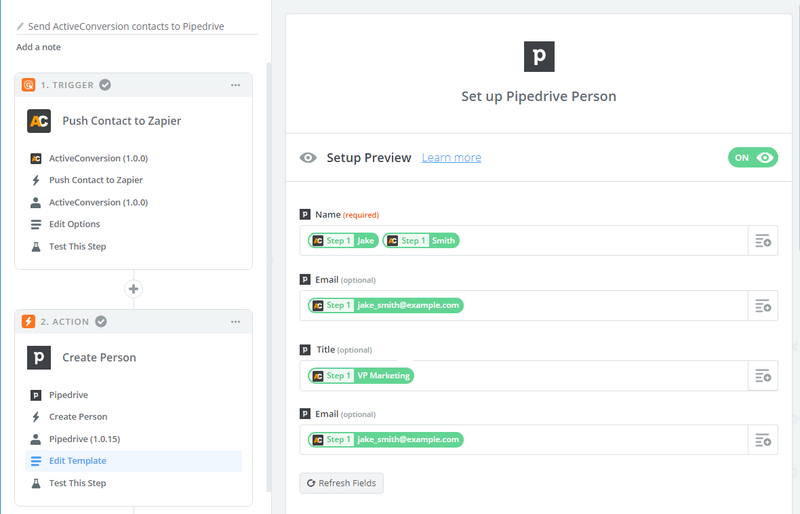 Zapier lets you build your own automated workflow (a Zap) to tie your CRM to ActiveConversion in the Zapier editor with a few clicks, no code required. A Zap is a connection between two apps made of a trigger and an action. Whenever the trigger event happens, Zapier will automatically make the action event happen for you. Zapier’s free accounts support single-step Zaps. This means you could find a contact in ActiveConversion (trigger) and create a new contact in your CRM (action) using a free account. If you wish to avoid creating duplicate contacts with your Zap you’ll want a paid Zapier account since this gives you the ability to create multi-step Zaps. Then you’ll have two actions: check if the contact exists (action 1) and then create a new contact if needed (action 2). When setting up your Zap, you’ll be able to create a template to tell your Zap were contact information from ActiveConversion should appear in your CRM. Most of our users Zap the first and last names job title, email address, phone number, and company name. Once the Zap is set up and running, new contacts in ActiveConversion should automatically start appearing in your CRM. Zapier’s free accounts support single-step Zaps. 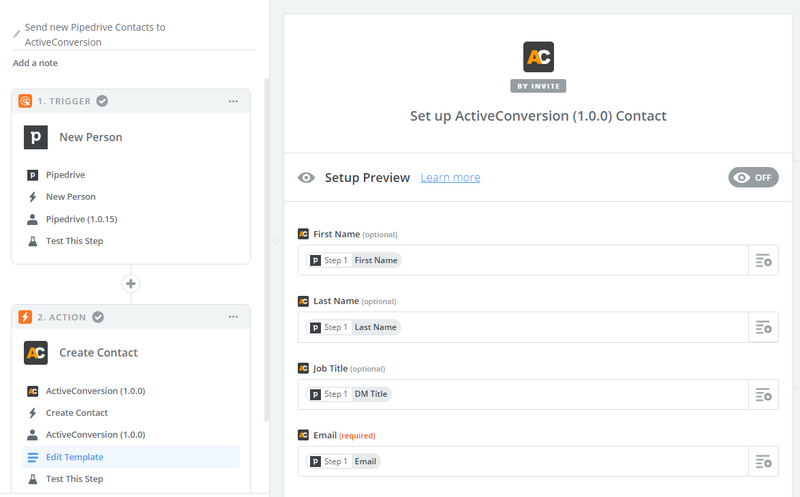 This means you can send any new CRM contacts in your CRM (trigger) and create a new contact in ActiveConversion (action) using a free account. Continue through the wizard to set up your trigger. Common triggers might include when a new person is created in your CRM or when a person is updated in your CRM. At this point you can either test your Zap or click “Finish” to turn the Zap on. Once the Zap is set up and running, new contacts in your CRM should automatically start appearing in ActiveConversion under Sales > Contacts. Where in ActiveConversion can I see the contacts sent from my CRM? The contacts added to your account will appear under Sales > Contacts. From there you can tag your contacts, assign to sales reps, add to nurture campaigns, and more. How much does the Zapier/ActiveConversion integration cost? Why is my Zap creating duplicate contacts in my CRM? The most likely reason is if you’re using a single-step Zap to add a contact, but not checking first if that contact already exists. Paid Zapier accounts allow for multi-step Zaps.